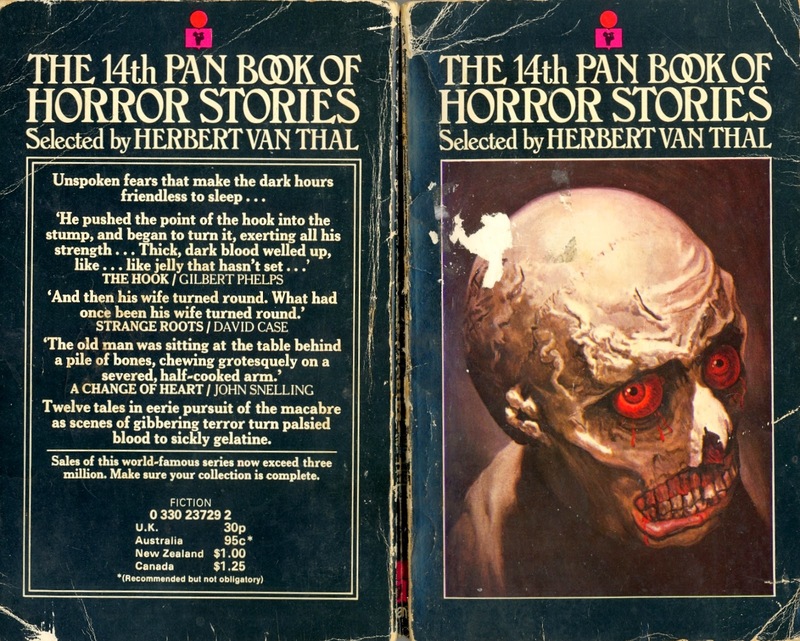 The cover star of Pan14 could at first glance be the formidable Sir Gore Ouslet Carruthers from Chetwynd-Hayes closer to the collection It Came to Dinner. But I know from a bit of interweb research that it is in fact a Josh Kirby (the chap behind the Discworld illustrations) representation of The Abominable Dr. Phibes. A seemingly crazy old man relates to a reporter a tale of a trip to a parallel Earth where plants have evolved into the dominant life form, and where humans are farmed as food. Sometimes you come across a story which is just so preposterously daft that you have no option but to stop totting up the list of plot holes, completely suspend all disbelief and just go with the flow. Such in the case with “Vortex", a delightfully entertaining slice of gore-dripping hokum, which mixes elements of Planet of the Apes, The Time Machine and Day of the Triffids to produce a nightmarish tale of agriculture gone crazy. But when Sabatini (a pseudonym if ever I heard one) names his protagonist Mr Bloom, we can be sure the whole gig is a bit of fun on his part. Clearly the author is attempting to post some sort of vegan friendly message here; for his plants actually do nothing more to the humans than farmers do to say an apple or sugar beet. Scientific impossibilities abound, but the one conundrum I would have liked to have been solved is how the woman Bloom brings back - his Weena, if you like - is transformed from a humanoid with “long billowing hair” and an “exquisite body” into a cactus. Mrs. Nesbit is the downtrodden, browbeaten wife of 25 years of her tedious martinet of a husband. But her salvation arrives in the form of a pair of Creative Funeral Directors, who thoughtfully mow down hubby (and associated dachshund) in their hearse, before bundling the still-warm bodies into a coffin. Mrs. N is left to clear up the blood on the road. These surreal narratives where characters would react relatively normally in the face of decidedly abnormal events used once to be the domain of Martin Waddell. But his tenure ended with Fried Man in Pan11, and this entry represented Conrad Hill’s taking up of the baton. However, it is a rather tame effort and Hill would go on to produce some rather more memorable stuff. The Schwartz of the title is an all powerful computer which has been entrusted with controlling almost every aspect of British industry, public services, communications and defence. Everything really. All goes swimmingly until Schwartz starts making a few eccentric decisions. Loneliness is diagnosed, so what could be the harm in getting a little chum for the big computer? A fun read, reminiscent of Spike Milligan at times, but never a horror story in a million years. Perhaps Turner had realised David Bowie had already explored the potential of an all omnipotent computer gone wrong in his song The Saviour Machine, and that the author felt he had to go for laughs. Three brothers live on a farm; with the eldest a drunkard and the youngest an imbecile, it is only the hard work of the middle brother which keeps the venture afloat. Whilst he is out ploughing, the other two attempt to seek out and destroy a rat in the barn with the aid of an iron bar, a can of petrol, and a box of matches. Things are patently not going to end well for someone. An eminently enjoyable tale, due mainly to Harrison taking the time with characterisation over the first few pages. Perhaps for the first occasion since I used to watch Tales of the Riverbank as a boy, did I find myself feeling sorry for a rat. Eddie Richardson was a chap who predated Steve Austin by a few years, in that he was your original bionic man with his aluminium legs, plastic hands and electronic innards. But he is not immortal, and the inscription on his tombstone fords someone the opportunity for a joke at his expense. A rather pointless piece this, with the bulk of the dull narrative simply serving to set up the lame one-liner punchline. This did represent the fourth light-hearted entry to Pan14. What was Bertie up to? Anton is a lone boffin beavering away in his home laboratory attempting to ascertain if lycanthropy, and the legends attributed to it, had their roots in “chemical and glandular imbalance” within the body. His work with canines suggests so, but he needs to be sure by testing out his serum on a human – and who better than his wife’s dull-witted lover. But having the condition passed from carrier to victim via kissing was always going to be a risky business. After the plethora of comedic tales which opened Pan14, what we all really needed was another deadly serious David Case epic. But bugger me, if Case was not infected with the same bug – for not only does Strange Roots pitch in at a mere 35 pages, but it is played for laughs as well! The author has Anton, of Balkan extraction and ridden with deep seated fears of werewolves, dabbling dangerously deep into just such a subject; the biochemistry of which is simply preposterous. The plotline – nymphomanic wife included – reads like a pitch for a re-make of Carry On Screaming, with the Monty Python-esque Ministry of Silly Research thrown for good measure. Horror story it most certainly is not, but it is David Case we are talking about here so the tale is, inevitably, extremely readable. I may have started to believe that Bertie had designated Pan14 as The First Pan Book of Humorous Horror Stories, but I noted Alex White was next in line. A young woman is sent to a clinic by her mother and step-father to “learn obedience”. There she is systematically raped and mutilated. We PBoHS readers had enjoyed (if that is the correct word) an early insight into the casually callous world of Alex White back in Pan7, but that tale was but a light romance compared to the unforgettable brutality of The Clinic. The tale from there on is a depressingly grim litany of abuse and disfigurement. The final image of a tear dropping from Ellen’s remaining eye is heart-rending. A spider spins a web across the recently dumped corpse of a naked woman. After catching a fly, it scurries down the body looking for a safe place to hide. Paula keeps seeing things. Horrible things. Specifically an old man hiding out in the abandoned building opposite who catches and devours dogs and cats. Once she even witnessed him murdering and eating a child. But no-one, not the police, neighbours or her husband Mike will believe her. She thinks she may be losing her mind, which actually suits Mike just fine, as the whole business is a set up to help him have his wife committed as insane. But as the plan nears completion he has the proverbial Change of Heart, and decides to call the whole thing off. But the vagrant he has paid to act as the cannibal stalker has developed taste for things. Stories set in the US were few and far between by this point in the series, although I am not sure the author was American as it has the feel of a story written by someone who had never set foot in America: flats are flats apparently and not apartments. The climax is not particularly shocking, partly because it is so predictable, but mainly because the author fails to paint Paula as anything but a two dimensional character. “Don’t bring your own coat-hangers” is the enigmatic phrase which always appears on Mrs. Rydall’s house-party invitations. Porson, like most other guests, is puzzled by the request but is too polite to enquire further. The brash Crittal, on the other hand, is keen that Mrs. Rydall spills the beans. But he has reasons beyond idle curiosity. A fine little story this, written almost in a mock Agatha Christie style, all the action set in a large country-house. The author sets out a neat little mystery which is apparently resolved, before hitting us with a delightful sting in the tail. The final scene where Porson is poking about in Mrs. Rydall’s room is a master class in tension building. Porson and Crittal are both well-developed characters; the former as pompous as the latter is brash, with both equally irritating in their way. A man returns to the riverside spot where, as a child, twenty-four years earlier he was subjected to a brutal sexual attack. His motives appear to be one of exorcising ghosts, but perhaps there is more to his visit. There is an irony to the fact that what could be described as Bertie’s comedic collection, contains two of the most disturbingly dark entries to the whole series in The Clinic and this one. Doubly ironic, in fact, given Conrad Hill general brought a lighter touch to proceedings. But this beautifully written tale explores that very difficult topic of child abuse, and the consequences thereof. The structure of the narrative takes the form of a nested story relating the events of twenty-four years earlier, bookended by a contemporary prologue and epilogue; the former scattering a series of puzzling clues, with the latter housing an even more shocking revelation. Much of the nested story has Hill describing in intimate detail the boy enjoying a solitary day’s fishing – probably the last truly carefree hours of his life - which at times put me in mind of A.L. Barker’s Submerged in Pan1. “he awoke to a low golden sun in the east with a few embarrassed straggler clouds caught naked in a clear blue sky, scurrying to hide in the dull anonymity far in the distance”. perhaps foreshadowing the Man hiding his own nakedness behind the dull anonymity of a raincoat. There is also a neat twist to the title which, although on the surface refers to the Boy and his attacker, upon reflection I feel actually represents the Boy as he was, and the Man he grew into. Wordsworth knew what he was about when he wrote: "The child is the father of the man”. A traveller stumbles upon a run-down country house in the fenlands, occupied by the odd, aristocratic Carruthers family who boast equally odd culinary tastes. Nevertheless, what an intriguing cast of characters he puts together: the educated tramp Herbert with his secretive background; Stafford Carruthers, the “middle-aged schoolboy looking for a holiday”; the domineering matriarch Lady Carruthers, not forgetting the 350-year old Sir Gore Ouslet Carruthers who, unlike the rest of the family, enjoys his meat unhung. “I’ll show you the remains of the garden; then if you are very good, perhaps we’ll have time to be very bad”. Hi, I cannot thank you enough for listing these stories because I've been searching for years to find 'The Vortex of Horror' as I remember reading it when about ten-years-old and discovered that it may be (in an anthology) released on Amazon. I wasn't supposed to be reading Pan books of horror when a child, but I devoured them and am now a professional horror writer with much success, such was the inspiration of the stories back then, now I create my own in my own words after being inspired by them and by Vincent Price, Bela Lugosi, Bram Stoker and many other great horror fiction writers. Edward Lee is one of my favourites too, Nelson Samuels, Sam West, Tim Miller, Wade H. Garrett and others too. Long live the horror genre. I did exactly the same! 35 years it took to rediscover a tale that stuck vividly. Thank you for your kind words. It is rather gratifying when I hear that someone has actually read some of the scribbles I have fired out into the ether. One does sometimes wonder. Long Live the Horror Genre indeed, Although, I do sometimes wonder if the Golden Age has gone forever, after Mr King dragged it kicking and screaming into the mainstream. Hi, being of a similar age. I used to lap up these books. We could buy them at age 11 in school from the book club! Not unusual for me to come home once a moth armed with a PBoH, together with Anne of Green Gables! Great site - thank you. Hi. I loved these stories back in the seventies. I used to lie in bed gazing at the covers. Giving yourself bad dreams, I bet. Hi. Thanks for these reviews. My Pan books are long gone with the wind. But I still remember them. Especially Alex White stories. "The Clinic" affected me deeply and I was angry for a long time because of it. The author should be commended for creating a truly memorable, if repellent story. Yes, The Clinic really is a harrowing read. It too made me angry at the sheer unfairness of it all.